Hundreds of millions of dollars have been leeched out of Canada during the past 14 years by almost 300 U.S. psychiatric hospitals, at the expense of the Canadian public. The evidence is conclusive. In the United States, bilked health insurance providers have recouped more than a billion dollars through successful legal actions. But in our case, the provincial governments hardest hitOntario and Albertahave done little to recover the estimated $1.5 billion they could have pursued through the courts to reimburse the public coffers. While a recent $130 million lawsuit filed by the Ontario government against 36 of the facilities involved addresses a portion of the fraud, there are still hundreds of millions of tax dollars unaccounted for. Moreover, to date there have been no criminal investigations by Ontario, Alberta or federal law enforcement agencies, and the psychiatrists and psychologists involved have escaped prosecution. n March 24, 1997, 100 agents of the U.S. Federal Bureau of Investigation executed search warrants and seized files from facilities owned by Hospital Corporation of America (now Columbia/HCA Healthcare Corp.) According to the Wall Street Journal, accompanying this small army were agents of the U.S. Internal Revenue Service, Department of Health and Human Services and the Defence Departments Criminal Investigation Service. This was followed by a shareholders lawsuit against the hospital chain on April 8, 1997. Allegations included practices of fraudulently inflated insurance billings and offering incentives to doctors to gain added business. On July 16, 1997, federal agents struck again when the FBI executed 35 court-authorized search warrants in six states, based on evidence of fraudulent referral, billing and other practices. This latest skirmish, in a cleanup of widespread insurance rip-offs by unethical psychiatric and other health care providers, underscores the rising tide of psychiatric fraud. Earlier, in June 1993, ABCs Day One national television show exposed that HCA-owned psychiatric facilities lured in teenage patients based on insurance dollars. Armed with a hidden camera, a group of actors posing as a family whose teenage son simply wanted to go live with his real mother went to two separate HCA-owned psychiatric hospitals. In both places, the boy was admitted after his health insurance had been verified even though he was suffering no real problems. In one instance, an intake administrator threatened the boy with the police if he did not enter the hospital. In another, an intake operator informed the parents that the boy had great insurance and immediately proceeded to talk about admitting him. Americans were not the only targets: Many Canadians were among those solicited into HCAs facilities in Texas and elsewhere in the United States. Investigations spearheaded by the Citizens Commission on Human Rights since the late 1980s reveal that, from as early as 1983, at least 272 U.S. facilities have thrived on what one Wisconsin hospital called the Canadian gravy train. Through various means they have billed the Alberta and Ontario health insurance plans for several hundred million dollars. Scores of psychiatric hospitals have been involved, including National Medical Enterprises and its subsidiary, Psychiatric Institutes of America. Many of these hospitals have since been found guilty of health insurance fraud and patient abuse by U.S. courts and numerous facilities have been closed down and settled suits by paying damages exceeding $1 billion. Others are currently under investigation by justice and law enforcement authorities, and still others are involved in litigation from health insurance providers, governments and other victims. The two primary sources of health insurance gravy were Alberta and Ontario, with the latter being the target of choice due to its extremely high and easily accessible out-of-country medical benefits. Until 1993, Ontario paid an astounding $1,500 per patient, per day, for foreign psychiatric treatment. This was then reduced to $200, but recently was raised again to $400 per day. Considering that the average daily cost to provide treatment for the elderly in the United States is $70 per person, Ontario is a lucrative target. In fact, between fiscal year 19921993 and 19951996, the Ontario Health Insurance Plan (OHIP) paid out roughly $30 million in out-of-country addiction and psychiatric treatment. Numerous criminal and civil convictions have occurred over the past few years and the process is accelerating. On May 3, 1995, the President of the United States announced the launch of Operation Restore Trust, a program designed to crack down on Medicare and Medicaid fraud. He emphasized that This operation builds on the success of an anti-fraud effort in Medicare that last year generated the largest federal health care settlement in history, with $379 million in government savings. It involved efforts by a team of HHS [Health and Human Services] and Justice officials, state representatives, and Medicare contractors to investigate illegal treatments of patients at psychiatric hospitals across the nation. The program has since proved to be a success and is being expanded. Despite the fact that these psychiatric syndicates have been and are being investigated and brought under the law in the United States, many culpable individuals and organizations within Canada are slipping through the net. Apparently, the vast array of investigations, raids by U.S. law enforcement agencies, legislation, civil and criminal prosecution, settlements with victims and more, have largely escaped the notice of the Ontario, Alberta and Canadian governments. 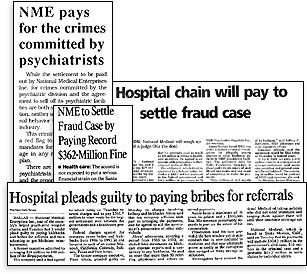 The 1980s was an explosive period of financial growth for the psychiatric hospital industry. And with that growth typically came increases in abuse and illegalities. In Texas, for example, it was found that counselors, telephone hot lines and other community programs were established by psychiatric hospitals. Their purpose was to ascertain a persons level of medical insurance coverage, and then to dupe them into treatment programs, with no regard to what their actual needs may be. But as private health insurance companies started to notice the ever-growing psychiatric billings, they started restricting the number of days for which they would cover such treatment. After all, at $30,000 per month per patient on the average, it was becoming extremely costly to health care providers. With profit-pressure on them, and U.S. insurance providers catching on, the psychiatric facilities expanded their zone of influence north of the border to Canada, which they found to be a lucrative market, ripe with patients with plenty of government-funded health coverage. According to the former executive director of OHIP, Robert MacMillan, American psychiatric hospitals collected more than $160 million from the Ontario government between 1987 and 1991 for substance abuse claims alone. This does not include all the other billing diagnostic categories such as schizophrenia and major depression, and an entire host of other psychiatric diagnoses (there are hundreds). All of these could be billed for, as long as it was covered by OHIP.